Sarah Hayland: I thought Sarah’s look was stylish, elegant, and age appropriate. I loved how she matched a timeless formal full skirt with a trendy crop top. It is an update and a nod to the days when Carolina Herrera was wearing a collared shirt with the formal skirt. I think Sarah is really serious about her career and last night she showed that she wants to play with the big kids and is here to stay. And clearly she got the emmy memo – wear coral! Lizzy Caplan: I absolutely loved the neckline and the cut outs and on this dress. Initially I thought the white train would be better black but I definitely warmed up to it. Every now and again it’s good shake things up a bit and do something a little out of the ordinary. Wouldn’t you agree?! Heidi Klum: The whole look from head to toe was fab and fresh. The dress fit perfectly. It was simple with a statement. I love that she wore her hair down and wavy and that her makeup looked natural. Most of the time, Heidi’s award show looks are not so hot and look like she is trying too hard. She is so stunningly beautiful that she doesn’t need much to wow us. She nailed it last night. And she got the coral memo. I loved all three looks because they were both classy and edgy at the same time! Claire Daines: What a gorgeous, vibrant red! She just pops in this Givenchy gown! I love the lace cutouts that carry around to a sheer lace back. 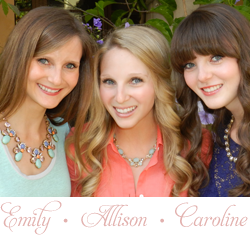 With a jeweled neckline like that, you can keep the jewelry simple… which is exactly what she did! Low maintenance! Loved the whole look… from head to toe! Camila Alves: I’m such a sucker for sheer cut outs!! And they can totally be trashy! But Camila pulls it off in this white and sheer Zuhair Murad gown. The silhouette of the dress was timeless yet the design was edgy. I also love seeing hair down on the red carpet! Camila always looks stunning. Cat Deely: I think Cat looked beautiful. Most of the time I don’t like what she is wearing. But, I loved this one her. I probably would have done something about that large messy bow. But the colors are simply stunning. Lena Headey: I love this asymmetrical, one shoulder, textured gown. I like that she kept the look pretty simple with the jewels. Her make up and hair was spot on. And the shoes go nicely too. I think I would like to have seen her spice it up a tad with the shoes, but the ones she chose work and let the dress take the spot light. So, I guess I can’t be too picky. January Jones: I love how bold and edgy her look is. It’s different and unique. I love the bold lip and how perfectly the edgy shoes go with that edgy ballgown. Some of our favorite moments last night were Aaron Paul’s speech because he was so sweet and humble and we are obsessed with Breaking Bad and also seeing Halle Berry present because we got our nails done earlier that day and she was there too (she chose light pink nail polish)!! We can’t wait until the next award show! To me, Lupita was the Oscars. She was so genuine and so thoughtful that you couldn’t help but fall for her. I don’t know about you, but I was in tears! Her fashion performance this award season has been stellar so I knew she wasn’t going to disappoint. This pretty powder blue gown stood out on her beautiful dark skin. But it might have been her smile that completed this look. Cate Blanchett. You are a movie star. Her whole look was perfectly and carefully curated – her stylist deserves a raise! I especially loved how her earrings matched the texture on the dress! I don’t normally love what Gulianna wears but tonight was the exception. I loved how she kept it simple with the hair and jewels so not to take away from the dress. Out of all the dresses, I think this is the dress that I would pick to wear myself. I love the color! Oh the Oscars! 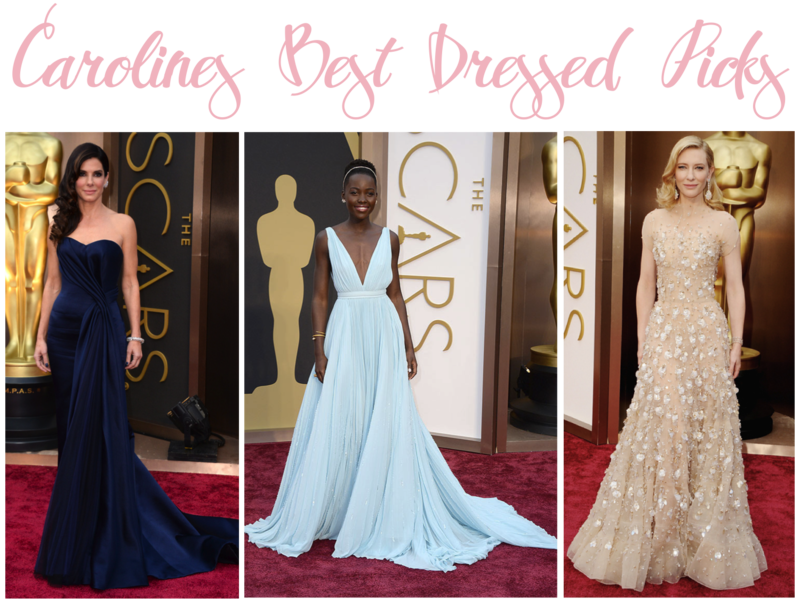 I had such a hard time picking my Best Dressed! How could you not pick Lupita and Cate?! I loved Emma Watson’s look too! I know not many will agree with me on this one. Her look really went unnoticed last night but I think it really was cool (like her Golden Globes look). I would have loved to have seen a cool necklace or bracelet to tie the look together but I still loved the simplicity of the dress. 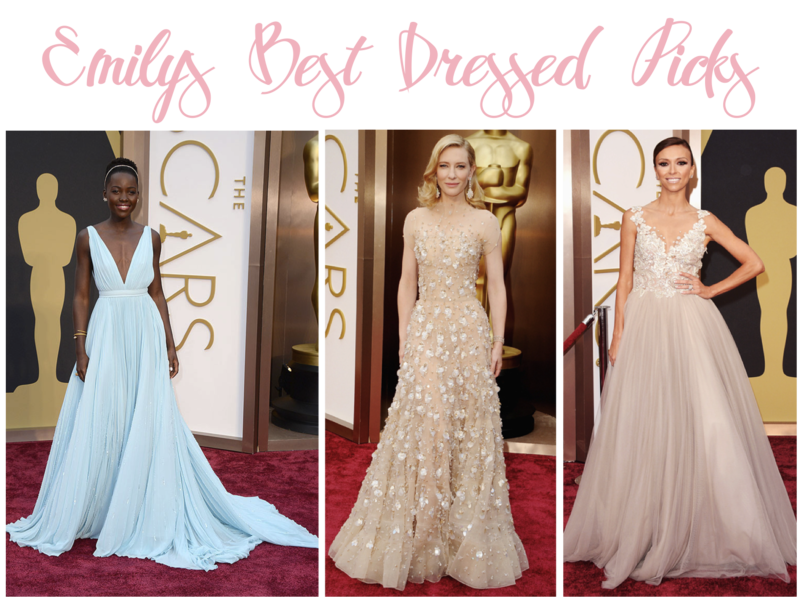 I had a really hard time picking (Emma, Angelina and Kate tied for third for me! )… I feel badly not including them. So my Very Honorable Mention goes to Angelina Jolie and Kate Hudson. Sandra Bullock looked absolutely beautiful last night. The reason I gave her my number one spot is because there isn’t one thing I would change about her look. The bracelet and earrings compliment each other well. Her hair was elegantly swept to the side opposite of the draping on her dress. She had matching navy blue nails. I really think she just nailed this look. Lupita looked wonderful last night too. I have to agree with everything my sisters said. She just radiates joy and you can’t help but smile when you look at her. The only thing I wasn’t crazy about was the random gold snake bracelet she wore, which clashed with her earrings, headband, and the sweet look she was going for. I give her a 99%. And she most definitely wins the BEST DRESSED OVERALL for this entire award show season. She shined on every single red carpet. That girl knows what she is doing (or at least her stylist does) and I love that she wears so much color. She is such an inspiration to so many people and I am so happy for her and her win. And just like my sisters said, Cate Blanchett looked stunning as well. The earrings, the dress, the makeup. The only thing I wasn’t crazy about was how her hair was down. It was just a little too busy for me. I think I would have liked to see her hair half up half down instead. But, other than that I adored her look just as much as I adored her performance in Blue Jasmine. We are so sad award season is over! But, we are already looking forward to next season (especially Caroline who will be able to watch the entire program from beginning to end instead of only being able to watch the highlights because she is abroad)! **Pictures from EOnline and Instyle. When the stars at the gym start amping up their arm work outs… I know there is a red carpet event around the corner. That’s right! 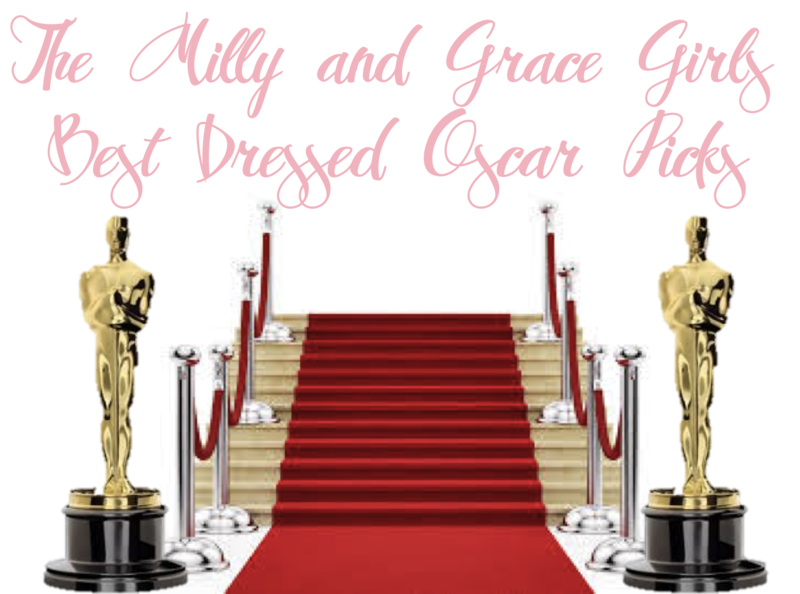 The Oscars are a week and a day away!! In honor of the them, I bring you my favorite arm work out. Tracy Anderson Standing Arms! In this first video, Tracy really explains each move and goes through them slowly. This is rare for her! The last video in this post is more her style… but try this one out first! This is my favorite! This video is from her original Mat DVD that I used to do in my dorm room! It is killer. I dare you all to try it. Even the men! “And you’re done with those!” The Ott girls (including Patty) know this one by heart… including what she says. And this final video is more like what we do in class! No explanations. Just going for it! Try it for fun! I hope you like them just as much as I do! And Summer is just around the corner too… You can use these videos to get ready for all those cute sleeveless dresses and tops that Milly & Grace will have this summer! You can set a goal and say…I am going to do one of these videos (especially the middle one) every night before I go to bed. I know you will start seeing results right away!